As CAP-USAF commander, Wootan is responsible for ensuring CAP — the Air Force auxiliary — is organized, trained and equipped to fulfill Air Force-assigned missions. CAP-USAF provides day-to-day support, advice and liaison to CAP’s more than 60,000 members and provides oversight for CAP programs, with emphasis on safety and program requirements. 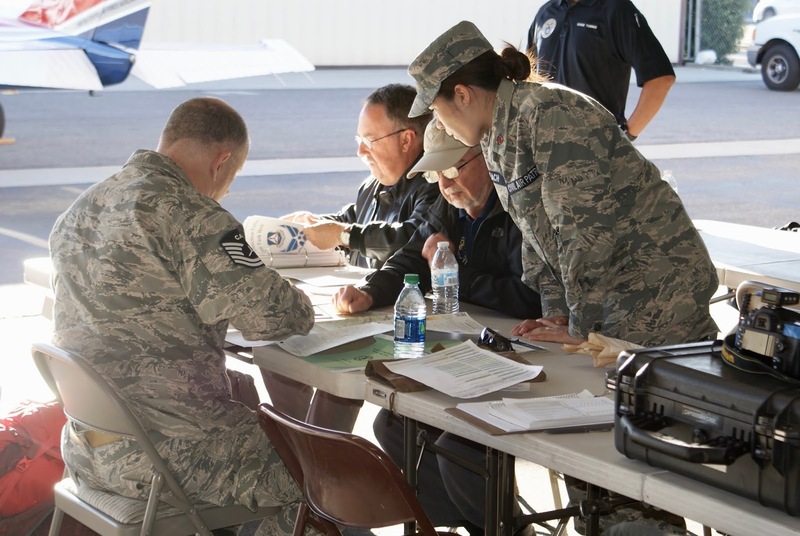 CAP-USAF personnel are also the primary function interface between other federal agencies and CAP. CAP-USAF is staffed with about 200 active-duty, reservist and civilian airmen at CAP National Headquarters at Maxwell AFB and locations in New Jersey, Maryland, Ohio, Georgia, Minnesota, Texas, Colorado, California and Florida, as well as in Puerto Rico and at several overseas Air Force installations. Wootan, with 30-plus years of active-duty Air Force service in international relations, military operations, command and defense, has served with Tyynismaa as national vice commander of CAP-USAF since July 2018. 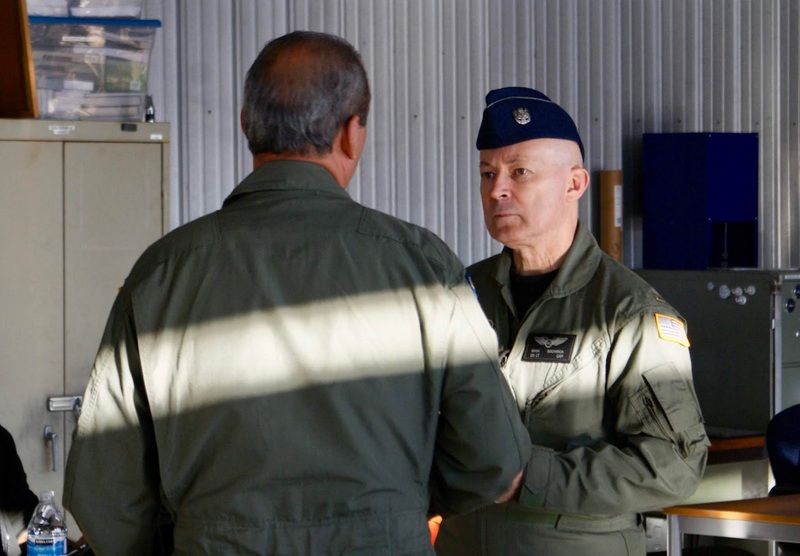 In addition to that duty, he has commanded a 300-member Air Force squadron and is certified in multiple airframes. An Air Force command pilot, he has been an instructor pilot in C-130 and T-34 military aircraft and has been responsible for teaching all facets of airdrop, airland, tactics, instrument and formation training. 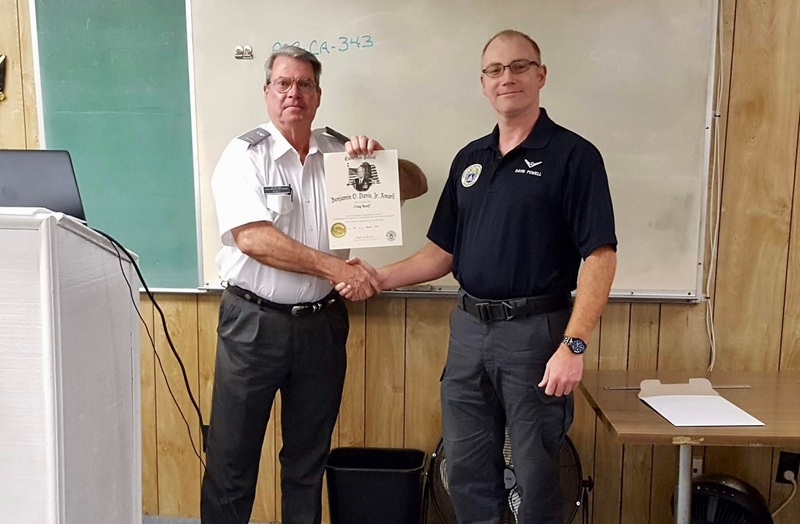 He has also served as an Air Force exchange officer to the U.S. Navy as a naval flight instructor. Wootan has more than 3,400 flying hours in the C-130 and T-34 as well as KC-135 and C-12 aircraft. His flight service includes 500 hours of combat and combat support in operations Iraqi Freedom, Enduring Freedom, Noble Anvil, Joint Task Force Horn of Africa and Northern Watch. He also led the Defense Intelligence Agency’s sole combat aircraft program in Pakistan and Afghanistan. His major awards and decorations include the Defense Superior Service Medal with one oak leaf cluster, the Meritorious Service Medal with two oak leaf clusters, the Air Medal, the Aerial Achievement Medal with one oak leaf cluster, the U.S. Navy/U.S. Marine Corps Commendation Medal, the Air Force Commendation Medal, U.S. Navy/U.S. Marine Corps Achievement Medal, Afghanistan Campaign Medal and Iraq Campaign Medal. In addition, he was the KC-135 Combat Crew Training School Distinguished Graduate as well as the Training Wing Five and City of Milton, Florida, Navy Flight Instructor of the Year. Wootan’s non-Air Force and foreign awards include the Czech Republic Army’s Merit of Order (Legion of Merit), Nebraska Air National Guard’s Legion of Merit, Czech Republic Military Police’s Commendation Medal and Pakistan Air Force Command Pilot wings. He is a graduate of the University of Arkansas, receiving a bachelor’s degree in mathematics in 1991 and a master’s degree in aeronautics from Embry-Riddle Aeronautical University in 1994. Later, he earned two other master’s degrees — one focused in air power from the Air Force’s School of Advanced Air and Space Studies at Maxwell AFB and one in national security from the National War College at Fort McNair in Washington, D.C.
Wootan and his wife, Diane, have two grown children, Katie and Jackson, and one grandchild. 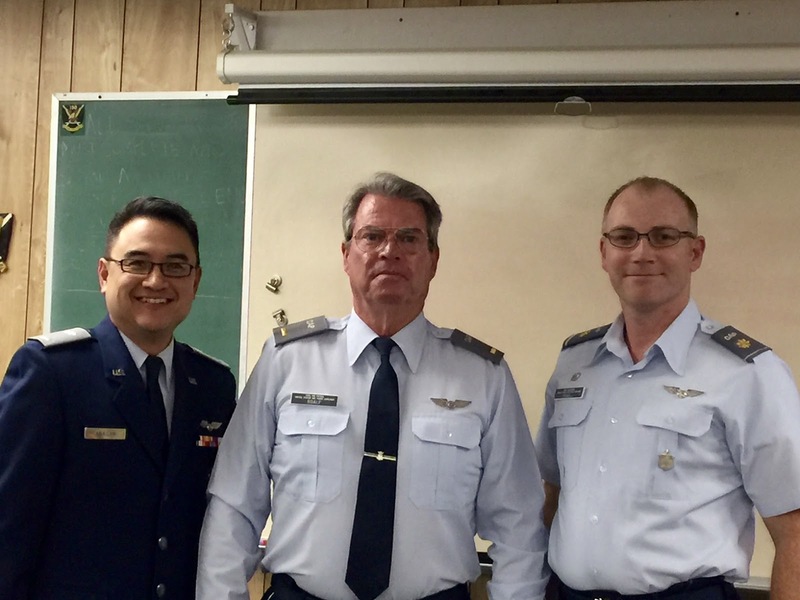 Congratulations to Eric Lin who was recently promoted to the grade of second lieutenant during a recent Squadron 150 meeting. 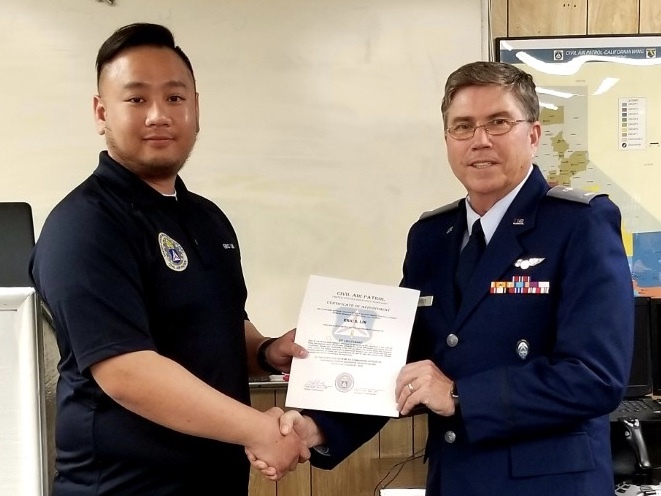 2nd Lt. Lin joined Civil Air Patrol in August 2018. He is currently training to become a Mission Scanner and he also serves as an assistant safety officer. 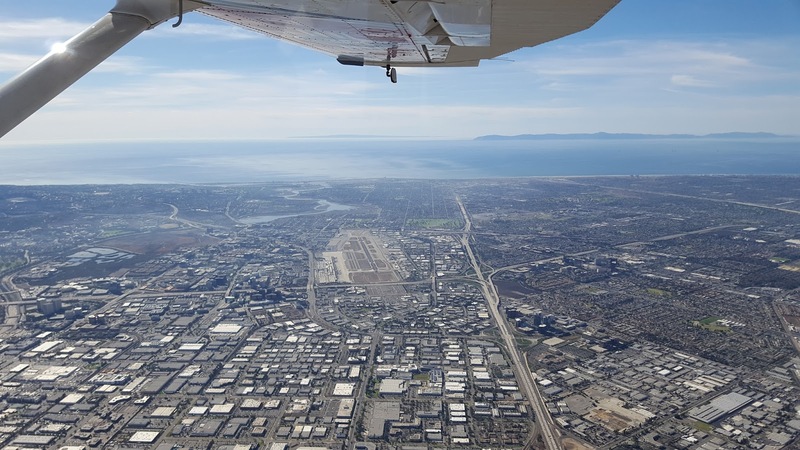 Pilots: How would you like to use your skill and abilities to serve your community, develop friendships with a team of dedicated volunteers, and gain opportunities to get more flight time? If this sounds good to you, Long Beach Senior Squadron 150, Civil Air Patrol would like to encourage you to join our team! Civil Air Patrol (CAP) owns the largest fleet of single-engine piston aircraft (primarily Cessna 172s and 182s) in the United States and we use them to perform missions in emergency services, disaster relief, homeland security, cadet orientation flights, counter drug operations, training exercises and proficiency flights. How do I become a CAP pilot? 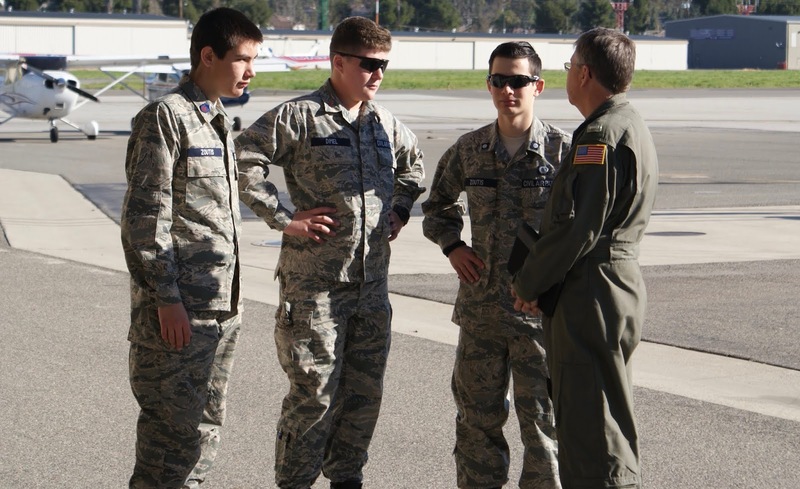 There are different levels of pilot qualifications in Civil Air Patrol, all with their own specific requirements. 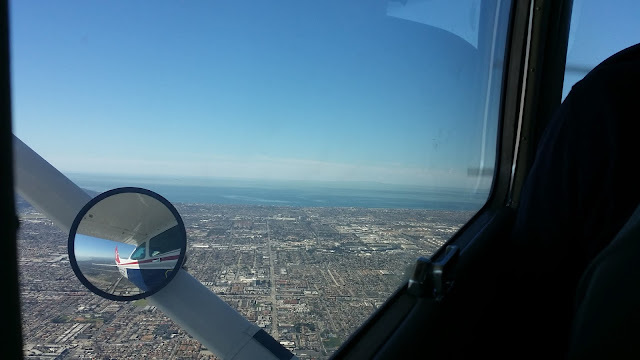 In all honestly, the road to becoming a pilot is not an instantaneous one…but it is worthwhile. 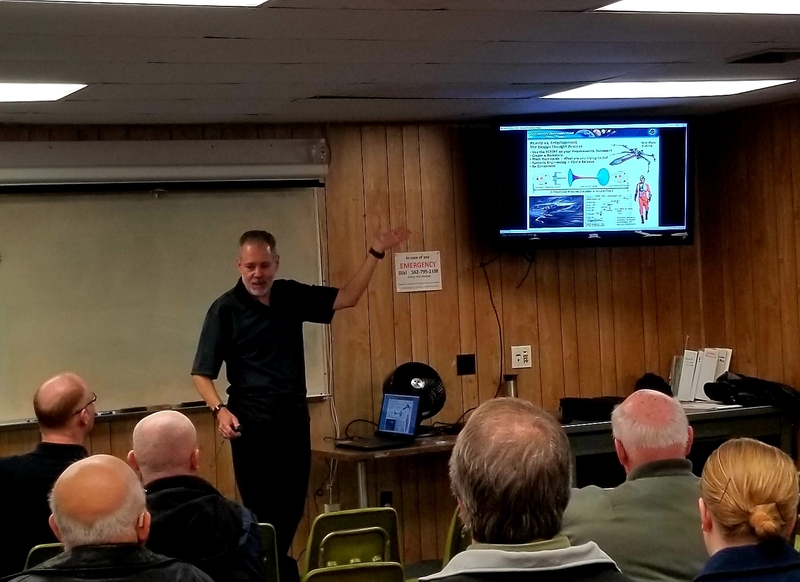 Once you’ve met the minimum requirements you will then need to meet the specific requirements for the different types of missions that pilots fly in CAP. Do I have to pay to fly? 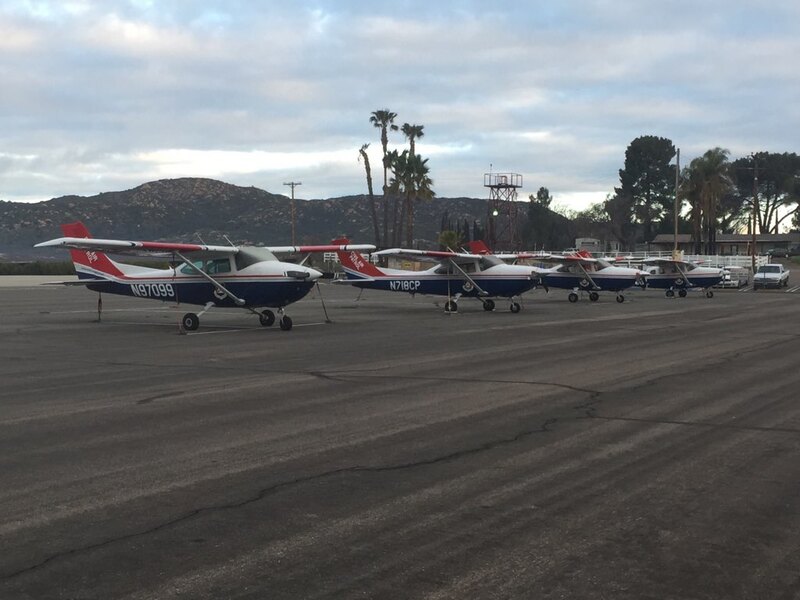 One of the benefits of being a pilot for Civil Air Patrol is that there may be opportunities for you to receive reimbursements for some of your flying! 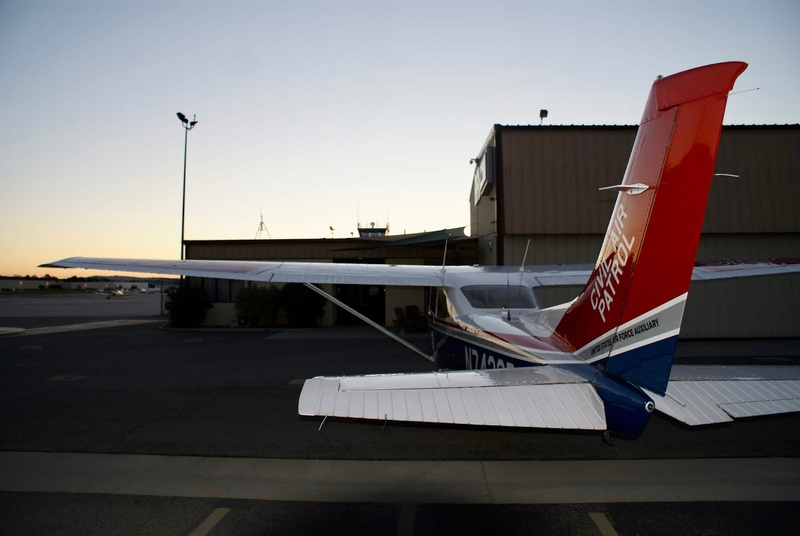 Keep in mind, reimbursed flying is NOT available when first becoming qualified to fly in CAP. 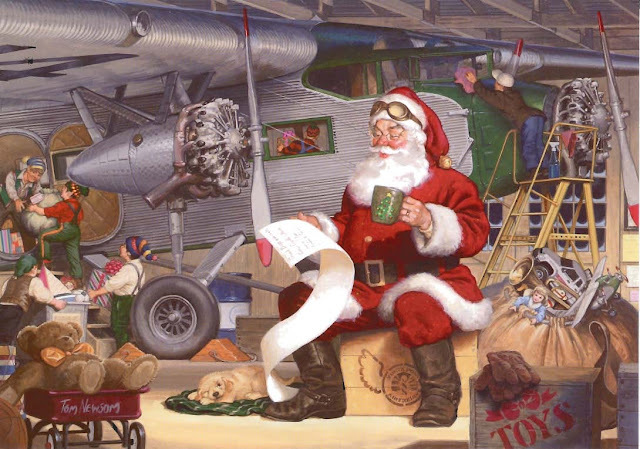 As a new member, you will be responsible for aircraft fuel and a flat rate per hour fee. This applies to the instructional flights one should have prior to taking the flight evaluation to become a CAP pilot, the evaluation itself and all flying after that until becoming mission qualified. Once qualified as a Transport Mission Pilot you will be eligible for reimbursed flying during scheduled training missions and actual missions. 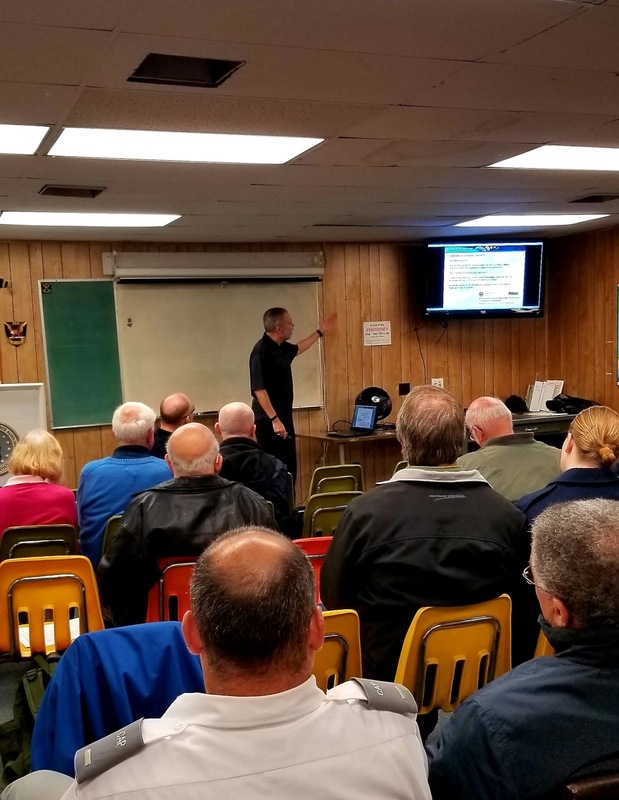 Other opportunities to participate in reimbursed flying occur when you qualify as a Search and Rescue/Disaster Relief Pilot or Cadet Orientation Pilot. CAP is composed entirely of volunteers who have chosen to serve our communities. As a CAP pilot you may find yourself using your unique skills and talents to help find a downed aircraft, assist the US Air Force on a training mission, take a cadet up on his/her first flight in an aircraft, and more! Members of Squadron 150 participated in a search and rescue training exercise during the weekend of 16 March-17 March, 2019. 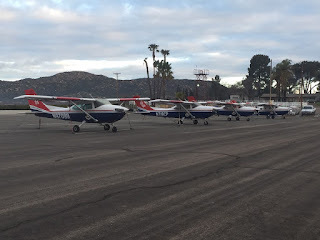 Mission base for the exercise was Fullerton Municipal Airport, where there are two Civil Air Patrol (CAP) squadrons stationed and one CAP airplane based there. 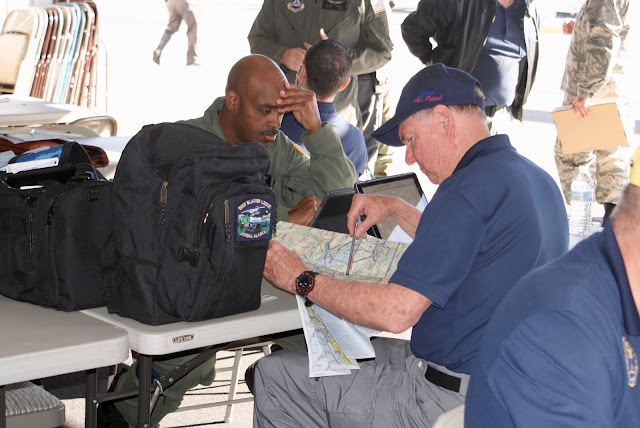 Squadron 150 members participated as aircrew members, communications staff, base staff and planning staff, helping to ensure (along with our other CAP members) that this training exercise was a success. Our very special thanks again to Aldo Spadoni who was our guest speaker for the recent Joint Group 7 Meeting that was hosted at Squadron 150 headquarters at Los Alamitos Joint Forces Training Base. Aldo gave a very interesting talk about "Exploring the Boundaries of Art, Design, Aerospace Engineering and Popular Culture." 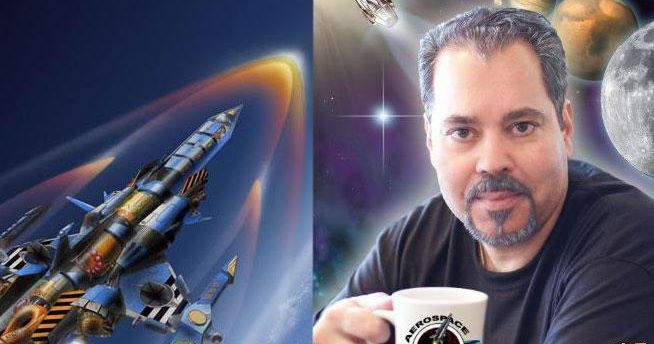 Aldo is the President of Aerospace Imagineering, is an MIT graduate with extensive experience as an aerospace engineer, conceptual designer, and futurist. He has contributed to the conceptual, prototype, and production design of numerous advanced aircraft, missiles, and spacecraft For NASA, DARPA and The U.S. Armed Services. He created an award-winning simulation team at Northrop Grumman Aerospace Systems. Aldo is also an accomplished concept designer/inventor with four U.S. patents, space artist, and Hollywood technical consultant. He has worked on movies such as Iron Man, Stealth and Iron Man 2. Retired U.S. Air Force Lt. Gen. James K. “Kevin” McLaughlin, former deputy commander of the U.S. Cyber Command, is the newest member of Civil Air Patrol’s Board of Governors. A 34-year veteran of the Air Force, McLaughlin currently serves as director of cyber policy, strategy and security at Texas A&M University's George Bush School of Government and Public Service. He’s also head of McLaughlin Global Associates LLC, a company focused on board service, consulting and public speaking. He retired from the military in September 2017. Before serving as the Cyber Command’s No. 2 official, McLaughlin commanded the 24th Air Force and Air Forces Cyber at Joint Base San Antonio-Lackland, Texas. He also worked for the National Reconnaissance Office and the Office of the Secretary of Defense. Maj. Gen. Mark Smith, CAP national commander and CEO, hailed McLaughlin’s appointment to the BoG as an important development in the organization’s continuing emphasis on cyber defense as a skill for cadets. “Gen. McLaughlin’s expertise in this area will help us focus even more on what’s already been a very strong program for our cadets,” Smith said. McLaughlin said, “I am extremely honored to join the CAP Board of Governors. The mission of CAP is important to the nation, to the Air Force, and to the thousands of volunteers and cadets who serve in the organization. I look forward to doing what I can to help CAP continue to grow and succeed in the future." He succeeds retired Air Force Lt. Gen. Judy Fedder as one of the four Air Force-appointed members of the 11-member BoG – CAP’s top governing body. Fedder joined the BoG in July 2015, shortly after retiring as deputy chief of staff for logistics, installations and mission support with the Air Force, and became BoG chair in February 2017. CAP Col. Brad Lynn succeeded her as BoG chair this week. Along with the Air Force appointees, the board consists of three members appointed jointly by the secretary of the Air Force and CAP’s national commander and four members-at-large selected by CAP’s Senior Advisory Group. The BoG moves CAP forward through collective decision-making to generate strategic policies, plans and programs designed to guide CAP both today and into the future. 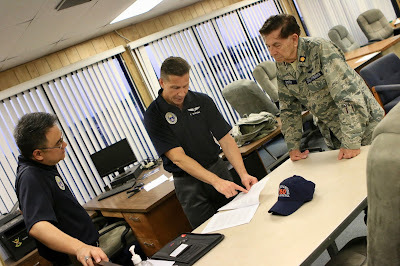 The BoG is assisted by CAP’s national commander and chief executive officer, the organization’s chief operating officer and the CAP-U.S. Air Force commander, who act as advisers. 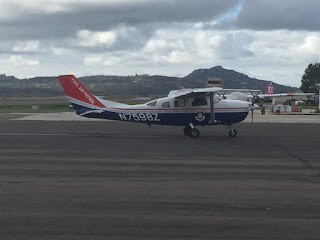 Members of Civil Air Patrol (CAP) Squadron 150 participated in a Search and Rescue Training Exercise (SAREX) held at Ramona Airport (KRNM) on 10 February through 11 February, 2019. 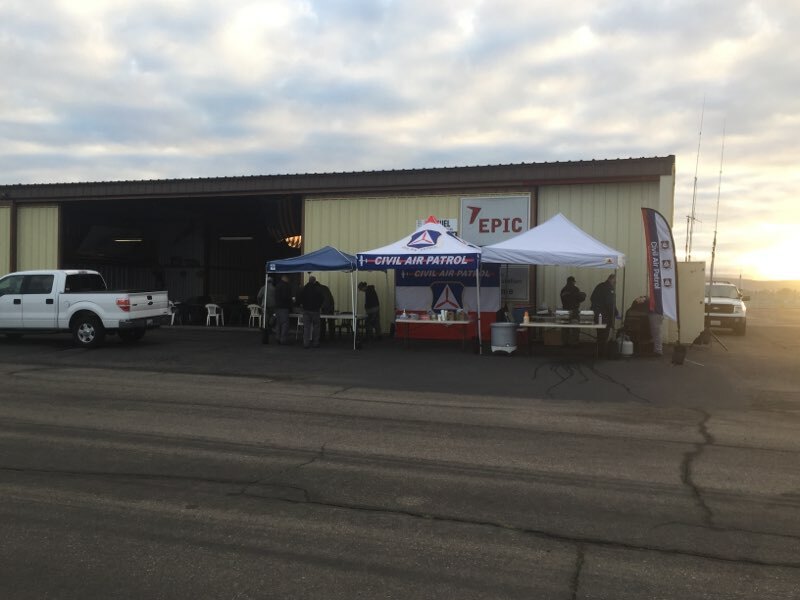 This event provided training opportunities for members wanting to qualify in aircrew, ground teams and base staff emergency services positions. Squadron 150 members completed qualifications for several emergency services positions including mission staff assistant and mission radio operator, along with flying several sorties over the weekend. Our thanks to the members of San Diego Senior Squadron 57 for hosting and putting on a terrific training exercise! Civil Air Patrol members conducting a search and rescue training exercise at Ramona Airport, 10 February, 2019-11 February, 2019. Thirty-three years ago today (28 January, 1986) we lost the crew of the Space Shuttle Challenger (STS-51L), when the orbiter exploded 73 seconds into the mission. It was determined that record cold temperatures damaged the rubber O-ring seals on the solid rocket boosters, reducing their ability to effectively seal the gap between the booster segments. This allowed superheated flare from the boosters to escape through the gaps, compromising the structural integrity of the external tank, causing a breakup of the vehicle in flight. Interest in STS-51was high around the nation because it was to have the first teacher-in-space. Christa McAuliffe, of New Hampshire, was selected among over 100 semi-finalists (from 11,000 original applicants) to fly on board Challenger. The plan was for her to teach several lessons while Challenger was in orbit, which would have been broadcast live to millions of schoolchildren. 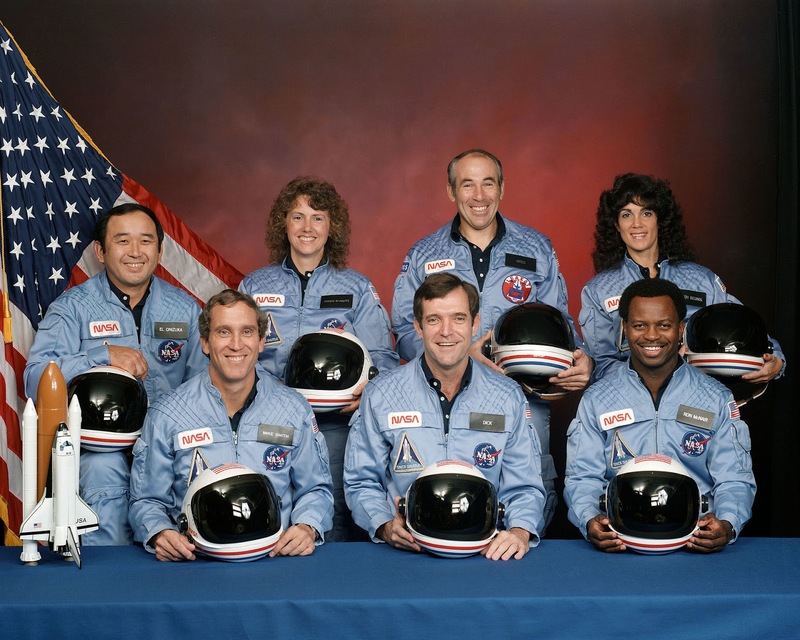 "In the aftermath of the Challenger accident, the families of the Challenger crew come together, firmly committed to the belief that they must carry on the spirit of their loved ones. They envision a place where children, teachers and citizens can touch the future: manipulate equipment, conduct experiments, solve problems, and work together, immersing themselves in space-like surroundings. Their goal is to spark youth interest and joy in science and engineering, believing that spark can change lives. With their collective efforts, they create Challenger Center for Space Science Education. " Fifty-two years ago today, on January 27, 1967 our nation lost the crew of Apollo 1 in a flash fire that occurred in their spacecraft during a test on Launch Complex 34 at Cape Kennedy Air Force Station in Florida. The commander of Apollo 1 was Lt. Col. Virgil "Gus" Grissom, USAF. Grissom was a veteran of two previous spaceflights; Liberty Bell 7 during the Mercury program and Molly Brown (Gemini 3). Grissom had been told privately by "Deke" Slayton (who was in charge of astronaut crew selection) that he would be the first to walk on the moon. The senior pilot was Lt. Col. Edward White, USAF who may have been best known for being the first American to "walk in space" during the mission of Gemini 4 in 1965. Apollo 1 would have been the first spaceflight for pilot Lt. Cmdr. Roger Chaffee, USN. On January 27, 1967 the crew was conducting what was called the "plugs out" test, which was a test of the spacecraft's systems, to ensure that everything was nominal for the mission's scheduled launch date of February 21, 1967. During the test the spacecraft was disconnected from any external sources of power and ran solely on battery power from the spacecraft. At approximately 6:31pm someone on the crew said, "We've got a fire in the cockpit!" It is believed that a spark originated in a bundle of wiring beneath Grissom's seat. In just a few seconds the spark, fueled by the pure oxygen atmosphere inside the spacecraft, raged through Apollo 1. Under ideal conditions it would have taken 90 seconds to open the three piece hatch; unfortunately the crew was lost within 30 seconds of the first "fire" transmission. 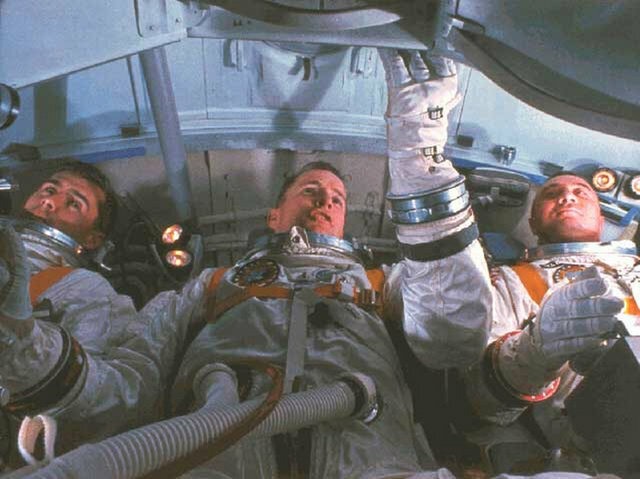 While Grissom, White and Chaffee would never fly their mission nor go to the moon, their mission, in a sense, made the moon landing possible. The investigation uncovered many things that were unsafe in the Apollo spacecraft design (such as the hatch, the use of flammable materials in the cabin and using a pure oxygen atmosphere while the spacecraft was on the ground) in NASA's policies and procedures, and in the general mindset that everyone associated with the program had. In our quest to reach the moon by the end of the decade corners were cut, unnecessary risks were taken and everyone suffered from "go-fever." The fire forced all involved to pause and reflect and come up with a better way forward...which they ultimately did. On July 20, 1969 Neil Armstrong famously took a "giant leap for mankind" as he and Edwin "Buzz" Aldrin became the first humans to walk on the moon during the Apollo 11 mission. In all twelve men, over six missions, walked on the moon during the Apollo program. Prior to his death Grissom was asked about the risks of spaceflight and this is what he said, "If we die, we want people to accept it. We're in a risky business, and we hope that if anything happens to us it will not delay the program. The conquest of space is worth the risk of life." Long Beach Senior Squadron 150 commander Maj. David Powell appointed 2nd Lt. Craig Roalf as the squadron's new deputy commander, succeeding 1st Lt. Rommel Anacan who served as deputy commander for two and a half years. 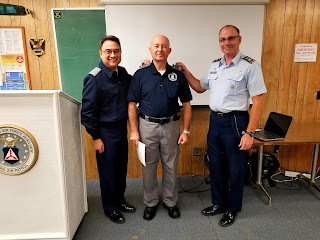 Powell said, "I chose 2nd Lt. Craig Roalf as my deputy commander because of his hard work, his extensive dedication to Civil Air Patrol, and his extraordinary passion for aviation. I am looking forward to working with him to develop a stellar squadron in 2019 that emphasizes emergency services and aerospace education." "I would like to humbly express my appreciation for being given the opportunity to assist Major Powell in the leadership role of our squadron in the position of deputy commander" said Roalf. 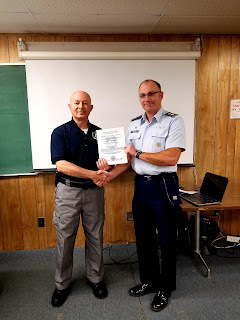 Roalf became a member of Civil Air Patrol (CAP) in June 2017 and, in addition to his new duties as deputy commander, also serves as Squadron 150's emergency services officer, emergency services training officer and assistant aerospace education officer. His emergency services qualifications include Mission Observer, Mission Scanner, Ground Team Member-Level 3, and Mission Radio Operator. Anacan will continue to serve as the public affairs officer for South Coast Group 7 (the parent organization of Long Beach Senior Squadron 150) and as the public affairs officer and assistant emergency services officer for Squadron 150. 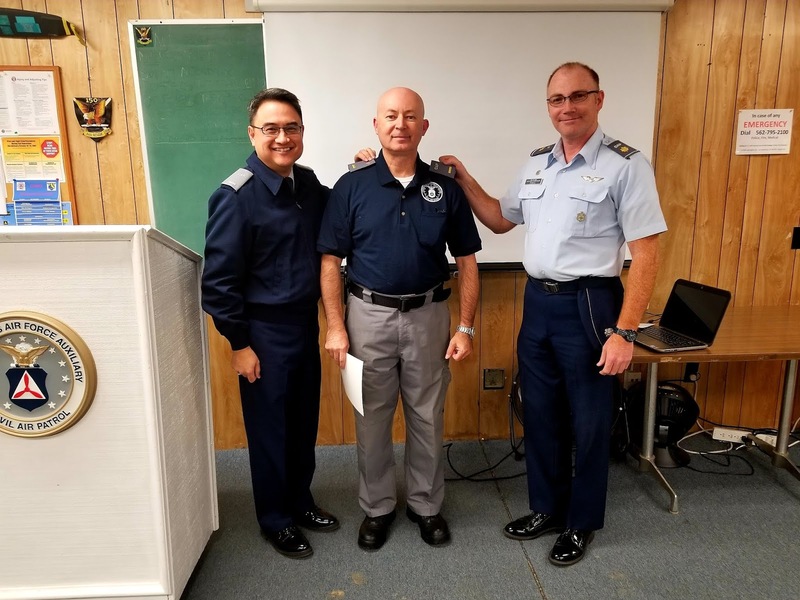 Long Beach Senior Squadron 150 announced the promotion of SM Mihai Sochirca to the grade of second lieutenant in the Civil Air Patrol (CAP), United States Air Force Auxiliary during a meeting on 6 December, 2018. 2nd Lieutenant Sochirca has been a member of CAP since February 2018. He currently serves as an assistant safety officer, assistant aerospace education officer and is a mission scanner trainee. Squadron 150 deputy commander 1st Lt. Rommel Anacan said, "2nd Lieutenant Sochirca has been a valued member of Squadron 150 since joining CAP. 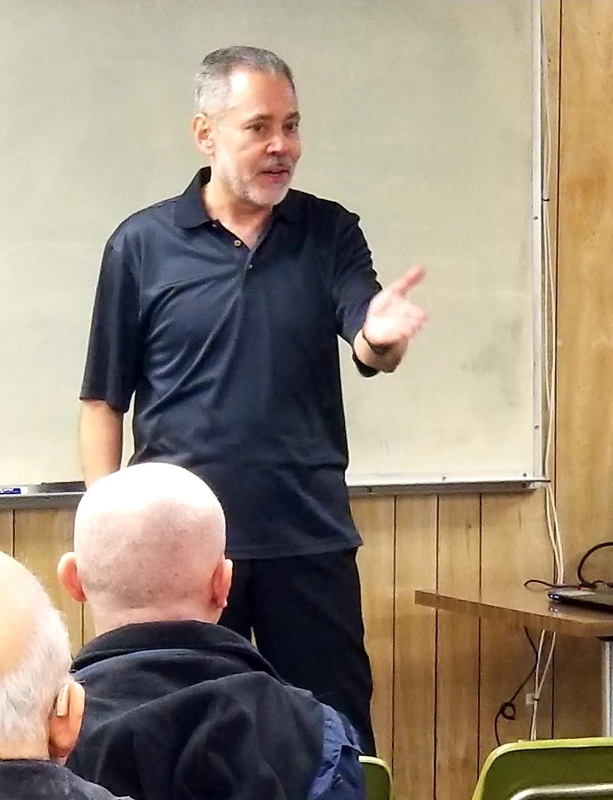 His knowledge and expertise has boosted our safety department's efforts; his emergency preparedness initiative has not only encouraged all squadron members to prepare now in the event of an emergency, but he has also made it very simple for members to know how to procure the needed items. We are highly appreciative of his efforts." 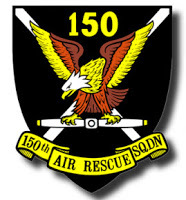 Join us this Thursday 10 January, 2019 for our next Squadron 150 meeting. 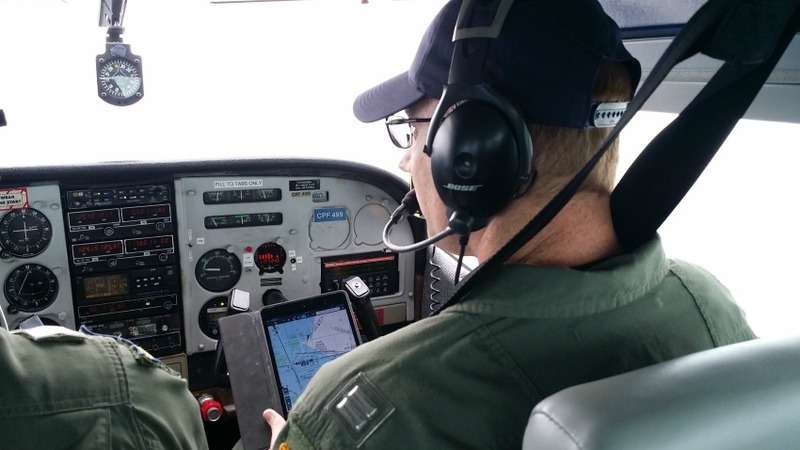 The topic will be on the Garmin VIRB camera system that is used by Civil Air Patrol (CAP) for airborne photography missions. 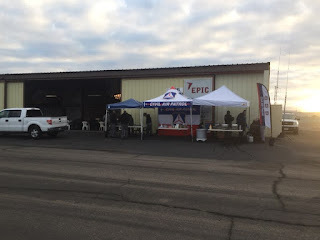 During the wildfires in Fall of 2017 in California CAP was tasked by FEMA with taking pictures of the affected areas. 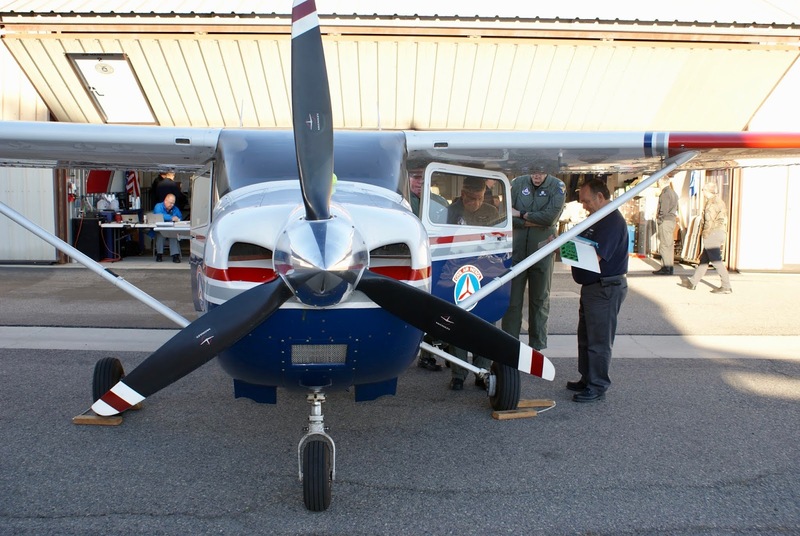 Civil Air Patrol aircrews flew about 140 flights taking roughly 6,000 photos with the wing-mounted VIRB cameras. We will also be discussing Garmin Drones and North American Aviation, time-permitting. If you are visiting for the first time, we recommend that you plan on arriving by 7:15pm so that we have some time to welcome you before the meeting begins. Please also plan on staying a few minutes after the meeting so that we can make sure to answer any questions you might have about serving in CAP. Civil Air Patrol Col. Lester L. Wolff, U.S. representative from New York from 1965-1981, turns 100 years old today. Four years ago, Wolff (second from left in the graphic photo below) was selected to receive the Congressional Gold Medal on behalf of CAP members -- like him -- who served on the home front during World War II. In addition to his service during the war, Wolff made many contributions to CAP in his lifetime, including legislation that led to full congressional funding for the organization. CAP National Headquarters joins with members of the Congressional Squadron (which he co-founded), as well as Wolff’s former constituents in New York, in thanking him for his service and wishing him a happy 100th birthday.